t all started as a Lenten challenge: on Ash Wednesday to be exact. The idea was to give up something for the Lenten season, as a sacrifice or offering. I love ramen and my wife would be easily tempted with tonkatsu (breaded chicken breast) from our favorite Japanese place, Santouka at Mitsuwa market place. So that will be our sacrifice. Prune and grow. My daughter, Talia, heard about our plans and decided to join. “For Lent, I will just eat vegan food” she declared. Wow. She does not eat red meat like me but she love cheese. To go vegan, you have to give up all dairy, animal, and seafood products. Only plant-based food products, like beans, nuts, soy, grains, etc., are allowed. For bread or any bakery products, they must not contain eggs or cows milk. What? So you can imagine how strict of a diet it is but others have done it. It is a lifestyle change. I thought I join her on her journey. I was already going in that direction before when I started giving up red meat and substituting tofu. I prefer eating salads and vegetables already, but I still was eating eggs and cheese. The no red-meat diet helps me during chemo when I get constipated or have my vomit episodes. I had to strike a balance on eating nutritious food to sustain me and comfort food (ahem…like ramen). Nonetheless, I saw the vegan lifestyle as an opportunity. For one, it will be only for the Lenten season (I think) and it would further strengthen my immune system. Remember my next challenge is an immuno-theraby treatment using clinical trial drugs to fight my cancer. So I am off on my new adventure. The first step is buying all these exotic sounding food, like chia, spelt bread, quinoa, almond milk, etc. My new friend now is Trader Joe’s or TJ. I was surprise that switching to vegan food was not too difficult, perhaps because of the new taste. I have now tried or switched to: eating spelt bread, steel-cut quinoa oat meal (this is good) for breakfast, edemame nuggets (looks and taste like chicken nuggets), tofu sausage, soy-based cheddar cheese (great for grilled cheese sandwich), and awesome vegan desserts. I even made myself scrambled tofu for breakfast and dinner. Bam! Look! 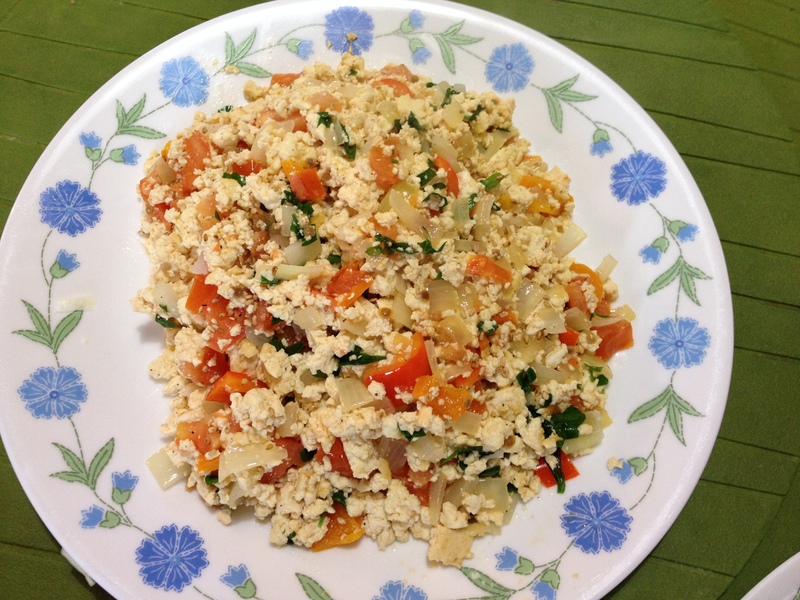 Scrambled tofu with tomato, onions, sweet baby bell peppers, and parsley. Yummy! Now, let me clarify things first about the vegan lifestyle. You can still gain weight eating vegan food, especially with their wicked desserts. While healthy, vegan food does not automatically equate to organic food, vegan just means no animal products. Beans and nuts, depending on portion size, has high caloric content. So there’s vegan food and organic food: two different things. For me, if it is a choice between vegan food and organic food in the grocery aisle, I go for organic. I don’t need more chemicals or toxins in by body. The point is to stay healthy and strengthen my immune system, and I would do anything to stay healthy. Bye…bye…Santouka ramen, hello Chicago Diner. OMG! P.S. This Sunday is the 8K Chicago Shamrock Shuffle race. I will be running it again with my wife and my oncologist. Dr. M is already getting stressed out for he has not run this far, so it will be fun. The forecast is 60F and sunny. Perfect. I love life. Last week I had my appointment at University of Chicago (UofC) Medicine. It was very promising. I also learned something new about my cancer and family history. From the results of my genetic testing, they have identified a mutated gene called RET that I may have inherited. This mutated RET is also the cause for Hirschsprung disease that my first-cousin, Tess, may have inherited when she was born. I remember she was operated, they took out a couple of inches of her large intestine. I was a kid back then and would just remember seeing the stitching scars in her belly when we go swimming. So I am blessed with this mutated gene, now what? How about immuno-therapy? Say what…???? The way Dr. R explained it, you use the person’s immune system to fight cancer. Like it or not, each of us have cancer cells. Some or most of us are lucky, due to good genes and healthy living, our immune system is able to keep the cancer cells in check. In my case, I inherited a cancer-triggering or mutated RET gene. So this misbehaving gene is blocking my immune system from doing its work of neutralizing my cancer. Such a troublemaker! Previously, all my treatments or chemotherapies were intended to poison the cancer using all sorts of drug in different doses and combination; I have taken a lot in the past six years. Chemo has its benefits but it is non-discriminate. It kills cancer cells as well as good cells. Chemo has also kept my cancer at bay but my cancer is no longer responding. Think of the Running Back as your immune system which is being blocked by a Tackle, the RET. We neutralize the Tackle so the Running Back can score. Sorry, Doc. I am not too much of fan of football. Soccer, especially English soccer, is my game but I get it. Spike the drink of the RET goalie so my boy Luis Suarez (of Liverpool) can score. Go Liverpool! Currently, they have a Phase 1 trial that can fit me. However, the trial is for melanoma but it addresses the same genetic RET mutation. We need to get approval from the manufacturer, Bristol Meyer Squib, to use the trial drugs: Nivolumab and Lirilumab for the nodules in my lungs. Once we have the approval, I am off to my “olympic” trials. For now, we wait. P.S. My wife and I did our runs doing a little bit over three miles. Will get there. The goal for now is the 8k Shamrock Shuffle race on March 30. Happy St. Patrick’s Day! A beautiful day for a run. The lake was still frozen. The morning air was cold at 26F (-3C) but the sun was out. The sky was blue so I just got to go out and run. 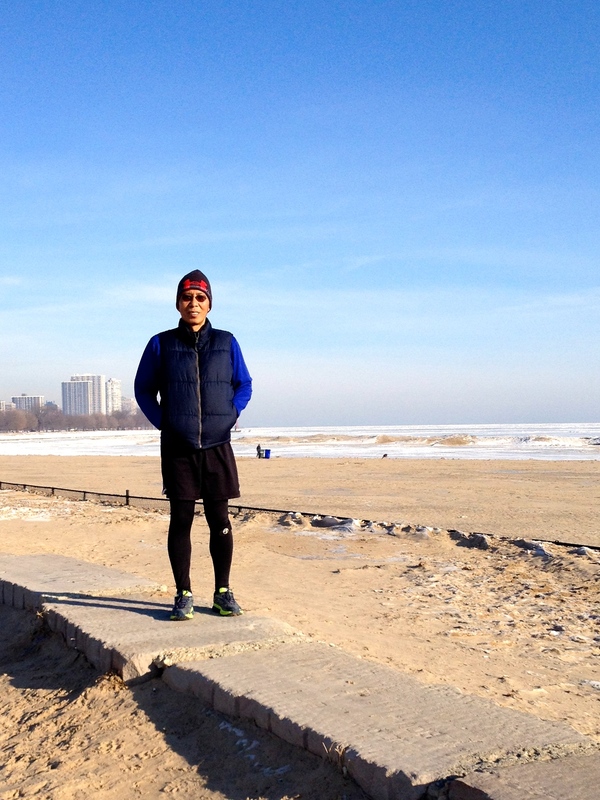 It is my first-time to run outside and I was excited. I have been exercising (spinning and cross-training) indoor but when there is an opportunity to run outside I take advantage. Life is beautiful. As always my wife, training partner, and nurse was with me to make sure nothing happens to me. Lucky huh? It was wonderful to be out there. Trails were clean. There were a few runners, but mostly it was peaceful. I run without music. It is so soothing to hear the steady cadence of my foot as it hit the ground. I got lost in the moment. The air was brisk and very refreshing to my cancer-riddled lungs. I wonder too how the 14 nodules in my lungs still enable me to run. I’ll take what is given. That’s three miles at 13 min-mile. Done. What a wonderful after glow feeling. Intoxicating. Only 23 more miles to go. CT Scan Result and Cardinal George. I had my CT scan last Thursday. I did not expect much of it since my CEA tumor count was trending up. Depending on your outlook; the good news is that the number of nodules is stable, still 14, or you can view at as three months of chemo which did not even kill one. There was also a slight increase in size in a few of the nodules. The bonus was there was no other metastasis to other organs. I try not to read too much to news like this. I can’t change it. I just accept it and move on. But there are certain news that stops me, like the cancer relapse of Cardinal Francis George Archbishop of Chicago. I can relate to his journey. It is his third time also and he will have to undergo aggressive chemotherapy. He is the leader of our church and helps many lost souls. That is so wrong. Cancer changes you, and for it to touch (again) a man of great conviction and belief is a humbling experience. He has the courage to ask for prayers when I look up to him to pray for me. Also, I wish I have the same ounce of courage he has. His braveness and acceptance of his fate is reflected in his word that I dare not even whisper. “While I am not experiencing symptoms of cancer at this time, this is a difficult form of the disease, and it will most probably eventually be the cause of my death.” —Cardinal George. God bless out, Cardinal George. P.S. I meet with University of Chicago doctors this week to discuss chemo trials. Life and death decisions are easy. They are binary. So when the doctor’s tell me I have to do chemo, I reluctantly do it or I die. That’s the way I see things. Of course, others may choose to let go because they do not have something or someone to live for. There are decisions that are hard because they are personal. Sending my mother home back to the Philippines is one of those hard decisions. She left two weeks ago and the house is not the same: It is quiet. I sent her home because, if anything happens to me, I don’t want her to see the end. I know about mother’s instinct and all that, but I will be helpless to protect her. It is much easier to carry on not worrying about her when the day comes. I only want good memories for her to remember me. I have plenty to keep me going, more than enough to get me to the next stage: The clinical trials (non-FDA approved drugs or experimental). I am looking forward to my next appointment at University of Chicago Medicine. The results of my genetic testing from Foundation Medicine are out and it identified one gene called RET that can unlock my cancer mystery. The report also listed trial drugs that maybe appropriate for me. All this is foreign to me, but my doctors are excited. So if they tell me I have to do this and that, that is easy. Just get me to the starting line and I will figure out how I will finish. At the finish line, I know who will be there: You, my family and of course, mom. It will be a sweet moment I look forward to because it is all worth all these years of struggle. P.S. My next U of C appointment is on March 12.